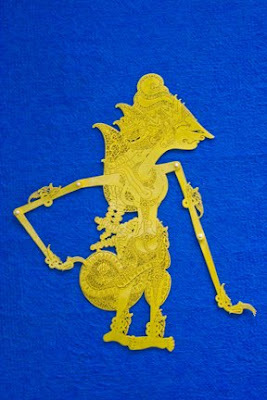 Wayang Kulit (wayang=show, kulit=skin, as in the leather the puppets are made of) is a type of shadow puppet theatre from the Indo-Malay archipelago. 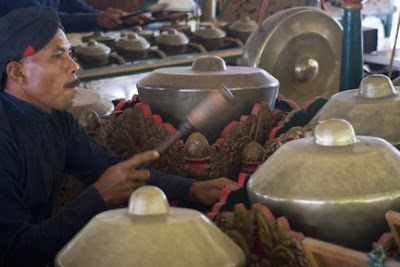 Its Javanese Hindu-Buddhist tradition has its origins in India. 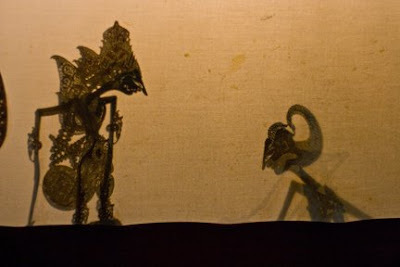 Hand-crafted leather puppets depict epic stories of the gods in shadow play. This artist was prepping the puppet show, at the Museum Sonobudoyo (Javanese archeology museum) on Jalan Trikora 6 at north alun-alun. 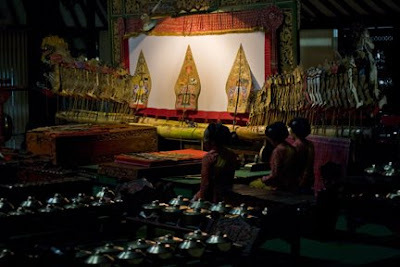 The puppets are usually made of buffalo or goat hide and mounted on bamboo sticks. 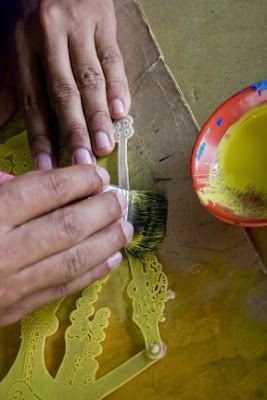 The best puppets are made of young female water buffalo parchment with curing time of almost ten years. 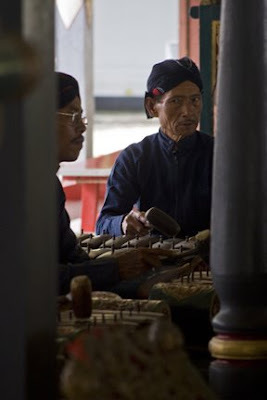 A traditional Gamelan orchestra would accompany the story-telling. Their typical repertoire include an overture, travel and battle music, and character pieces. 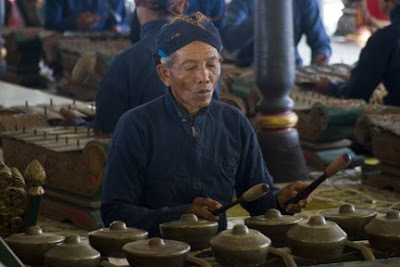 The next photos are of musicians playing their Gamelan instruments, preparing for the same puppet theatre at Kraton (Sultan's Palace). 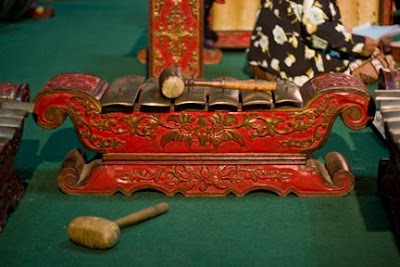 This first instrument is a Bonang and the one below is a Saron Demung, followed by a better photo of that instrument in red. 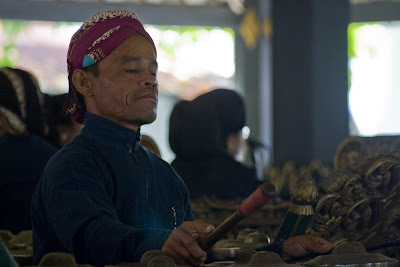 This musician was playing the Kenong, the next down is a Bonang, and the third is the setup behind the stage where Sinden singers are practicing. 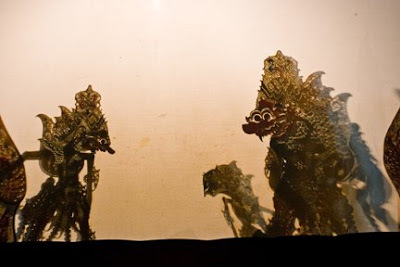 Most shadow play is based on two epic stories from India - the Mahabarata and its sister work, the Ramayana. 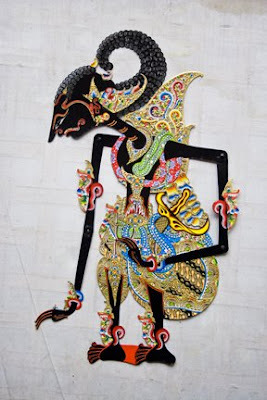 The Balinese and Javanese combined the Hindu stories with Buddhist and Muslim elements as well as their own folklore.